black-magic spells and was believed to aid burglars in breaking into homes and buildings. The hand of glory was the right hand of a murderer, ideally severed while the corpse still swung from the gallows, or cut during an eclipse of the Moon. It was wrapped in a shroud, squeezed of blood and pickled for two weeks in an earthenware jar with salt, long peppers and saltpeter. It was then either dried in an oven with vervain, an herb believed to repel demons, or laid out to dry in the sun, preferably during the dog days of August. Once preserved, the hand was fitted with CANDLES between the fingers. The candles, called "dead man's candles," were made from the murderer's fat, with the wick being made from his hair. In another method of curing, the hand of glory was bled, dried and dipped in wax, so that the fingers themselves could be lit as candles. With candles or fingers burning, the hand of glory supposedly had the power to freeze people in their footsteps and render them speechless. Burglars lit hands of glory before breaking into a house, confident that the charm would keep the occupants in a deep sleep while they plundered the household. If the thumb refused to burn, it meant someone in the house was awake and could not be charmed. 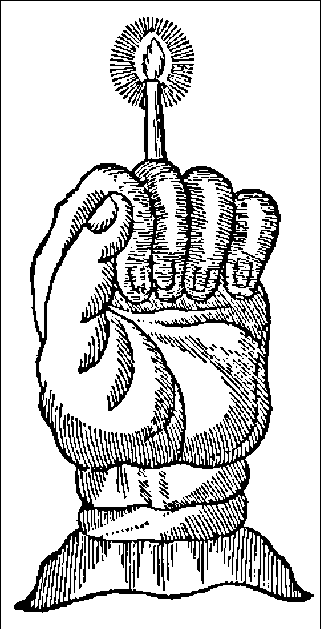 According to lore, once a hand of glory was lit, nothing but milk could extinguish it. As a counter-charm, homeowners made oiNTMENTS from the blood of screech oWLS, the fat of while hens and the bile of black CATS and smeared it on their thresholds. Hands of glory were linked to witches during the witch-hunt centuries. In 1588 two German women, Nichel and Bessers, who were accused of witchcraft and the exhumation of corpses, admitted they poisoned helpless people after lighting hands of glory to immobilize them. John Fian, who was severely tortured in his witch trial in Scotland in 1590, confessed to using a hand of glory to break into a church, where he performed a service to the DEVIL.